Today my TAFE group had a final practical assessment for our sixth lesson. 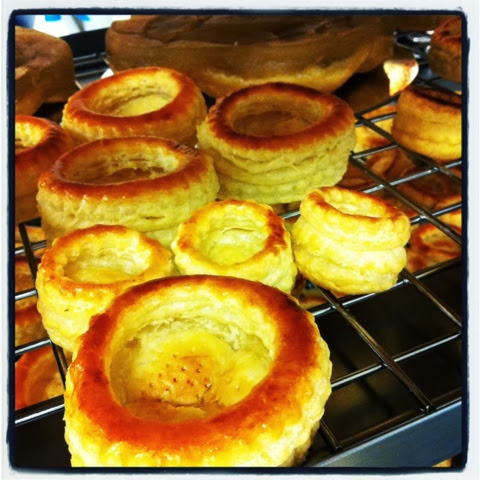 It was a 5.5 hours practical assessment where we had to produce 4 pastry items. They were namely: 12x vol-au-vent (puff pastry shells), palmiers, 12 x eclairs (custard profiteroles dipped in chocolate compound), and apple pie (short pastry rub in method). The puff pastry was made using the French method, with a total of six half turns. Surprisingly I had the least problems making the vol-au-vent, and palmiers. The two items I had the most difficulty making was surprisingly rolling out the short pastry to be shaped into the aluminium pie tin, and the custard filling for the eclairs. I am guessing that the top of the pie broke because I took too long plasticising the dough, as it constantly fell apart. The teacher commented probably it was the dough was too thick. The second thing I had difficulty making was the pastry cream for the eclairs. It's not actually that difficult, but because most of us don't have much practice with it, we aren't too familiar with the process. Finally, the last item we had difficulty making was the choux pastry as we only did that once in class, and weren't exactly too sure how the panyada process actually takes place. The teacher showed us a different way of making it which is through using the mixer with a paddle attachment. The teacher allowed us to take home our creations, which I did. It so happened we had a guest coming on the same afternoon. 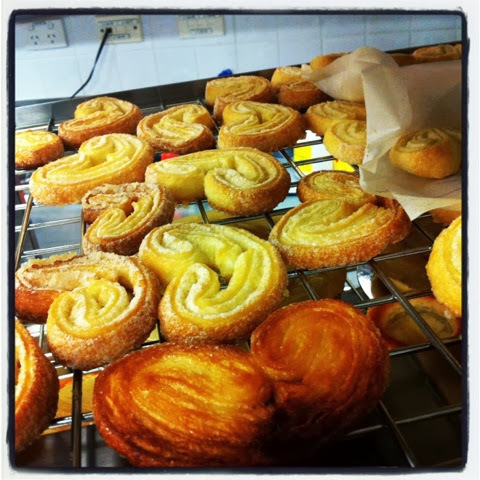 However I kept the Palmiers as they were my favourite! There aren't as many pictures as I did during my weekend baking classes as the students are constantly on the move. Instead, we write down and take notes in our recipe cards so we can remember the procedures during our own baking time. The best news I've had so far since starting classes at TAFE is I'm 3 kgs lighter after three weeks! Fighting!! Where u taking these baking lesson?